I was the victim of a crime last night. I shouldn’t grumble too much; it’s well documented that misdemeanours even themselves out over the long-term. After all, I was a beneficiary of the greatest pickpocket of all time last May. However, last night my Barclays Bike was stolen as I nipped into Tescos to buy some chicken breasts. I’d left the bike leaning against the glass shop-front, unattended. So, in fairness, I only really have myself to blame. On a similar note, Luis Suarez would probably concede that he, too, only has himself to blame for missing out on the recently announced player of the year awards. But that makes the voting no less of a robbery than the theft which left me in tatters and without transport on a sunny evening in the Aldgate area. For reasons yet to become clear, the journalists at Too Good Towers did not receive their ballot papers in time to vote for this year’s Football Writers’ Player of the Year. Despite this oversight, Too Good can exclusively report that a mere two of the 400 journalists who made the cut plumped for Luis Suarez. These journalists, many of them earning above the minimum wage, ought to expect their editors to wield the tactical axe in the coming days. For there has been a clear dereliction of journalistic duty. Suarez has scored more goals (30) than Robin van Persie (29) and Gareth Bale (24) this year and he’s done so with a better goals-to-game average. One might be tempted to assume that Bale, a (nominally) deeper lying player, has more assists than Suarez. Not true. Suarez has 5 to Bale’s 4. To put that into perspective, this means that Suarez has managed to get Liverpool players to score goals on five separate occasions this season. Still not impressed? One of them was Jordan Henderson. It’s not just the bare statistics either, which never tell the full story. Suarez is probably the best penalty-box dribbler currently in the game. He’s as good as Messi at it. Time and time again this season we have seen Suarez wriggle through massed ranks of opposition defenders in the most lethal area of the pitch. His ability to emerge from seemingly impossible positions rarely seen this side of a Where’s Wally? annual. He’s the slipperiest eel in world football. Robin van Persie plays for one of the best teams in Europe. 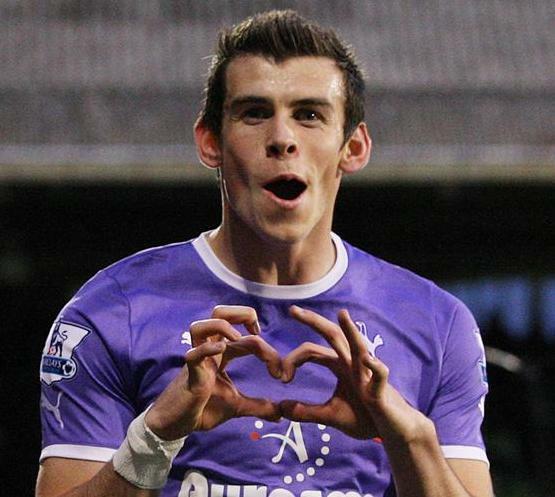 Gareth Bale plays for a team that should still end up in the Champions League. At the risk of exciting the flared nostrils and righteous indignation of Liverpool fans, Luis Suarez plays for Liverpool. An average side who, but for his goals, would be staring at a bottom-half finish this season. Goals of a stunning quality, including a moment of pure genius that few players on earth can produce. I’ll lift the veil of innocence now as we draw to a close. I do know why people didn’t vote for Luis Suarez. They didn’t vote for him because he’s a dickhead. They didn’t vote for him because he says ignorant things and nibbles on centre-backs. None of which is likely to make him a Knight of the Realm any time soon. That said, previous winners of the two player of the year awards include human beings who have committed all manner of impropriety, moral and legal (including, sadly, incidents of both racism and assault). It’s a nice idea to give the award to the most upstanding chap on the pitch, but that just isn’t the criteria. If it was, Gareth Southgate would have won the Ballon d’Or. The player of the year award is for recognising the season’s best player. The best player in England this season, for all his faults, was Luis Suarez. Lovely Gareth was quick to show there was no hard feelings between him and Luis. ← A Ryder Cup for football?